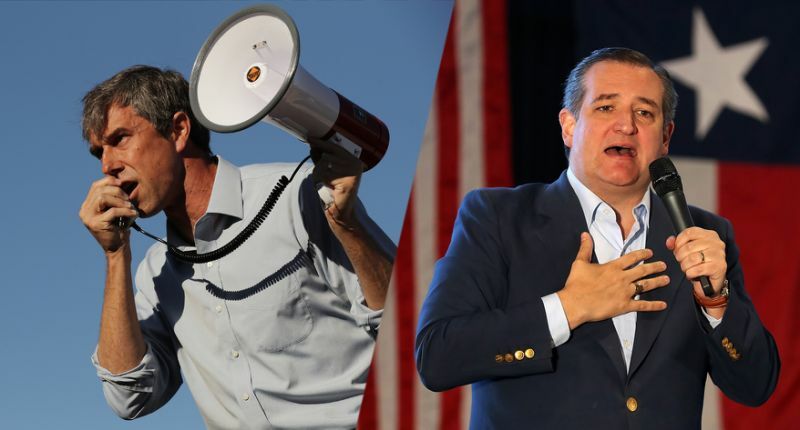 Yesterday on Friday, the last day for candidates of both Parties including Beto O'Rourke of Democrats and Ted Cruz of Republics to rally the voters in Texas. Beto O'Rourke who is the most hopeful Democratic Senator for this election on Nov. 6th, 2018, rallied six public campaigns on this day at his age of 70 in two weeks. He spent thousands of miles all over the state with his strong belief that he might become the first Democratic elected statewide Senator in Texas in 24 years. But according to Holly Bailey, Notional Correspondent of Yahoo News, entering the final weekend of Texas’s closely watched Senate race, in which polls suggest Beto O'Rourke has cut Sen. Ted Cruz’s lead to 5 percentage points or less, O’Rourke seemed frustrated by his human limitations, his inability to be everywhere he needed to be, to personally reach the shrinking pool of undecided voters in far-flung regions of the state who could very well decide the outcome of the election. DALLAS — When Beto O’Rourke wrapped up his day here late Friday, rallying supporters in what he noted was the aptly named Opportunity Park, his voice was hoarse and scratchy, and there were bags under his eyes from lack of sleep. It was the Democratic Senate hopeful’s sixth public event of the day — his 70th in two weeks — a breakneck pace that has taken him thousands of miles all over the state in his uphill bid to become the first Democrat elected statewide in Texas in 24 years. But entering the final weekend of Texas’s closely watched Senate race, in which polls suggest he has cut Sen. Ted Cruz’s lead to 5 percentage points or less, O’Rourke seemed frustrated by his human limitations, his inability to be everywhere he needed to be, to personally reach the shrinking pool of undecided voters in far-flung regions of the state who could very well decide the outcome of the election. The ultimate test of whether the three-term congressman from El Paso succeeds in his quest to unseat Cruz, a one-term tea party Republican looking for another six years in Washington, is likely to come down to who can win the battle on the ground. And the two candidates have taken different approaches. Bolstered by the record-breaking $47 million in campaign contributions he’s raised since July, O’Rourke has bet big on what he regularly describes as the largest grassroots field operation ever for a Texas Democrat, mostly overseen by unpaid volunteers. As of Friday, the campaign was operating more than 750 of what it describes as “pop-up offices,” volunteer-managed campaign outposts in all of the state’s 254 counties. Some outposts are in offices, while others are housed in private homes. All are being used as staging areas to deploy supporters on get-out-the-vote efforts, even on the dusty back roads of rural Texas, where residents rarely vote. The strategy is intended to build on the organic support that O’Rourke generated in the early days of his Senate bid. Aides to his sparsely staffed campaign were surprised to find out that individual supporters, including in strongly conservative cities like Amarillo and Longview, had taken it upon themselves to open up campaign offices on the candidate’s behalf. The supporters, known among O’Rourke aides as the “super-volunteers,” often didn’t coordinate with the campaign first, forcing staffers to scramble to make sure they were in compliance with federal election laws. In Longview, an East Texas town where Republicans have coasted to easy victories for decades, O’Rourke has attracted crowds upward of 1,000 people in recent visits, a reception that the congressman’s aides back in El Paso have credited to efforts by local volunteers. And in the final weeks of the campaign, they have sought to expand that strategy across the state, investing money in campaign gear and signs and picking up the tab for office rent while hiring more field staff to help supplement what they say is still a volunteer-led effort driven by old-fashioned door-knocking and word of mouth about where they should go to win votes. Since formally launching its get-out-the-vote effort in early October, the O’Rourke campaign said volunteers had made more than 8.7 million phone calls on his behalf and knocked on more than 1 million doors. “And we may knock on another million before this is all over,” O’Rourke said earlier this week. Texas, with a population of around 28 million, has about 7.4 million households, according to census data. Cruz, on the other hand, said Friday that he had just 18 paid field staffers devoted to his ground game efforts. Instead, he has largely outsourced the effort to the campaign of Texas Gov. Greg Abbott, who has invested nearly $20 million in a sophisticated data-driven voter targeting operation that sends campaign workers exactly where they need to go to woo potential voters, including conservative Democrats who they believe can be won over. Abbott, who is expected to easily win reelection, committed last year to helping the rest of the Republican ticket. According to the governor’s campaign, Abbott has deployed over 125,000 field workers across the state, plus thousands more who have stepped up to volunteer in the final days of the election. And they’ve spoken to more than 3 million voters, going door-to-door in areas like the Rio Grande Valley, a heavily Hispanic region of Texas where they believe they can turn out conservative Latinos to vote Republican. The decision to hand over control of the field to Abbott has freed up money for Cruz, who has struggled to match O’Rourke’s record-breaking fundraising. But it also means the Republican senator has less control over his strategy. And while Abbott’s workers are canvassing for the entire Republican slate, their primary mission is to drive up the vote for the governor, who is rumored to have aspirations for national office. It’s not entirely clear how strongly they are making the case for Cruz. At a campaign stop in Fort Worth on Friday, Cruz lamented that his ground operation was smaller than O’Rourke’s — although he did not mention the work that Abbott and his team are doing on his behalf. “That’s what money does,” he said, telling supporters that “Hollywood liberals and liberals all over this country” were sending campaign checks to his opponent. There are signs the ground game by both sides is having an effect, although it’s unclear which side is benefitting more. As of Friday morning, more than 4.3 million Texans had already voted early in the state’s 30 largest counties, where turnout levels have surpassed those in 2014, the last midterm election year. In areas around Dallas and Fort Worth, a region both campaigns believe could very well decide the outcome of the race, early voting numbers were on pace to match the 2016 presidential race, a striking of level of enthusiasm in a state where less than half of registered voters on average turn out to the polls. In the final three days before Election Day, Cruz is spending his time on a bus tour that will take him from Houston to the Rio Grande Valley to Dallas and back to the suburbs of Houston, a region that used to be strongly Republican but is now a battleground. While Cruz is known for shaking the hand of every last supporter who attends his events, he has spent little time canvassing for votes. But on Saturday, O’Rourke was spending hours going door-to-door around Dallas, accompanied by his wife, Amy, and their three kids, and joining volunteers who have already been working on his behalf.